Both sexes: Grey-brown upperparts, whitish underparts with bold black spots. The upperparts of the Mistle Thrush are grey-brown. The breast and flanks are a pale buff with bold black spots, which are scattered all over the underparts. The wing feathers have pale edges, which gives the appearance of a pale patch on the wing when seen from a distance. Juveniles are pale and heavily spotted on the upperparts. The Mistle Thrush's alarm call is like a football rattle or machine gun. The Mistle Thrush's diet is the same as the Song Thrush's: insects, worms, slugs but rarely snails, and berries, such as yew, rowan, hawthorn and holly. In the winter, a Mistle Thrush will often vigorously defend a berry laden bush from other thrushes. The bulky grass-lined nest of grass, roots, moss, leaves and earth is built by the female, usually in the fork of a tree but also in shrubs and walls. 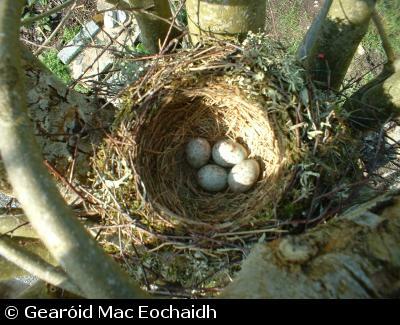 The smooth, glossy pale blue eggs have reddish-brown spots, and are approximately 31 mm by 22 mm. The female incubates the eggs by herself. 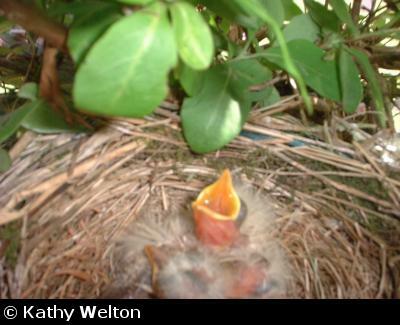 After the young hatch, they are fed by both parents. 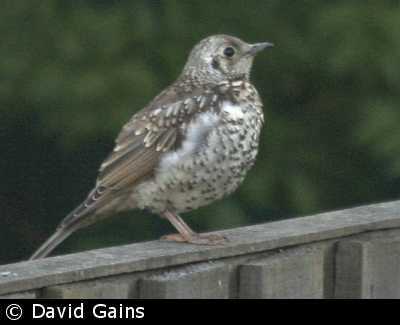 The Mistle Thrush is resident with most birds being sedentary, but some do migrate; for example, some Scottish birds winter in Ireland and others make it to France. 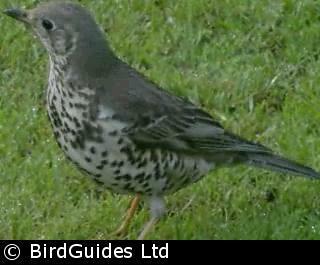 A few Scandinavian and northern European Mistle Thrushes winter in the UK, especially down the east coast. 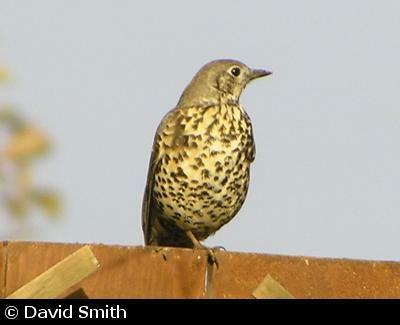 The population of Mistle Thrushes has diminished since the mid-1970s, especially in farmland areas, and so they appear on the Amber List, though some surveys suggest this decline may have halted.